France’s draft plan to ban on wearing the burqa would involve a fine of €150 for wearing the full veil, Le Monde reports. Anyone forcing a woman to wear a full veil faces up to a year in prison and a €15,000 fine. 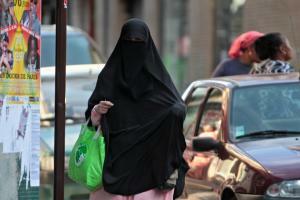 Meanwhile, Belgium’s draft law would make it a crime to wear clothing that covers or partly covers the face. Penalties would include a fine of up to €25 and a week in prison, the FT reports. Politicians in the Netherlands and Italy have pushed for similar measures. just WHO is doing WHAT in OUR name? i am so glad that muslim people know that everyday humans support them. if they believed the western politicians, they would think we hated everything about them. i think i speak as an ordinary person of the everyday when i say, thanks for knowing we respect your right to do and wear what you desire. we all like to do what we feel makes us feel good. so… please don’t change! happy mayday to every worker in the whole world ever!